Are you a present, past, or future student looking for Career Help? Umpqua Community College is committed to providing you with a variety of career services and resources. As a UCC student, you can access the following in Advising and Career Services, located in the Student Center building, during regular business hours. Some resources are also available online. Career Coaching can help you choose a course of study and decide on a career that is suited to your aptitude, personality, interest, and skills. Experiential Learning opportunities include informational interviews, job shadowing, internships, and cooperative work experience. 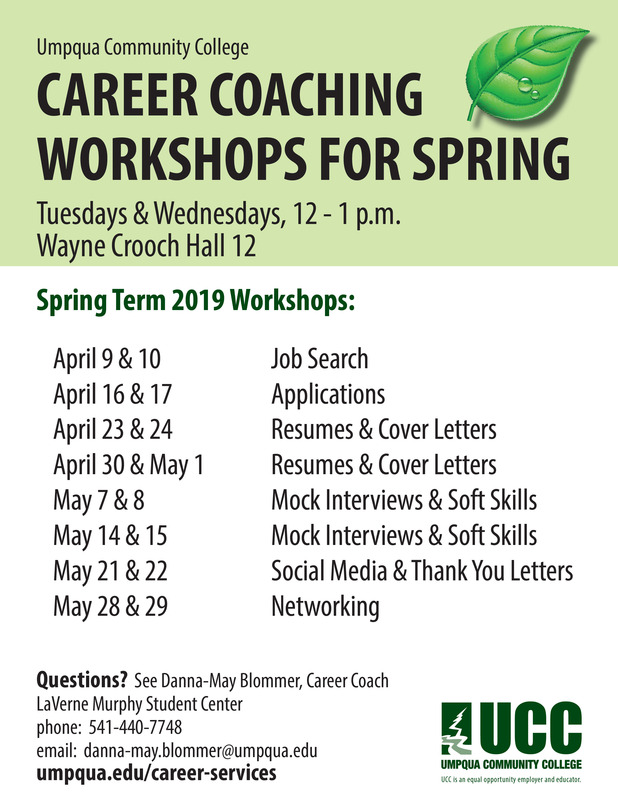 If you are a current student and wish to make an appointment, please click on the file below for directions to make a Career Coaching appointment or this link make an appointment here. Student Job placement services are available through the Financial Aid Office under the federal Job Location and Development Program (JLD). Student Job placement identifies employment opportunities within our community for students who want to work regardless if they are eligible for federal student aid. Part-time and full-time vacancies are posted online at http://www.umpqua.edu/student-job-placement. Program registration is required. Please visit the Student Job Placement page for more information.